Catch up with all the DOTCOM Waste news now! Catch up on the news from DOTCOM Waste with our final round-up of the project’s activities. 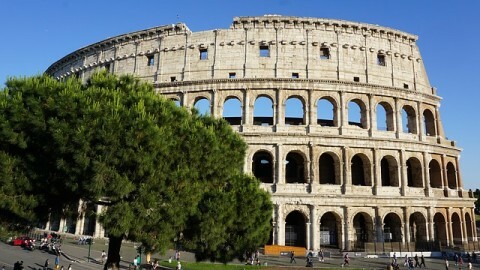 Find out what happened at the training events in Rome and Beijing. Read about our conference held in conjunction with BlockWaste, entitled ‘No Time To Waste! Synergies and Strategies to Tackle Waste Crime’. Also learn how you can access and benefit from the project’s practical Online Training Toolkit. Brussels, Belgium – DOTCOM Waste and BlockWaste have joined forces for today’s conference, “No Time To Waste! Synergies and Strategies to Tackle Waste Crime.” This interactive event will showcase the key results of the two projects on illegal waste management and trade, financed by the Internal Security Fund of the European Union. Those involved in targeting waste crime such as regulators, environmental authorities, law enforcement agencies, and researchers, will be brought up to date on the latest waste crime trends, EU Council activities and recommendations, and practical tools available for prevention and detection, as well as a look at what the future could bring. The conference is taking place at Representation of the State of North Rhine-Westphalia, Brussels, Belgium. The keynote address is being delivered by Marina de Gier, Chair of the IMPEL Working Group of TFS and David Ellero, Business Manager, O2-B Operations Economic Property and Crime unit, EUROPOL. A high-level roundtable discussion with representatives of six international institutions involved in the fight against environmental crime will follow on the recent EU Council Conclusions on Environmental Crimes and Recommendations. Attendees will then also be invited to discuss their views on “understanding illegal waste trade: today’s reality and tomorrow’s perspectives”. Practical tools to counter illegal waste trade will also be presented, including the DOTCOM Waste Online Training Toolkit, which provides practical training materials to strengthen enforcement authorities. The conference will be concluded with the discussion of a set of proposals addressed to policy makers and areas for future research initiatives. Participants will in particular discuss concrete ideas on how to further develop inspection methodologies and tools (such as the Mobile App for inspectors, “WATCH-IT”) and how to improve the exchange of intelligence and operational information that can support intelligence-led and cross-border investigations. Finally, concrete follow-up initiatives will be also launched during the conference, such as the development of tailored training materials and the promotion of further seminars. This includes multidisciplinary initiatives involving all the actors in the environmental crime enforcement chains, such as police, customs, national environmental inspectorates and other administrative and judicial authorities in the environmental field. Project coordinator Terhi Kankaanranta emphasises that “the joint conference offers the participants broader understanding about the complexities of illegal waste trafficking, when scientific results obtained in the BlockWaste project can now easily be reflected in the future training material”. BlockWaste project had an ambitious objective to produce information to be used in intelligence-led prevention of organised waste trafficking crime. The Project succeeded in identifying typical modus operandi and loopholes in regulation, and estimating lost revenues due to illegal actions. In addition, emerging threats in the waste sector, as well as loopholes in practical cross-border co-operation were identified. 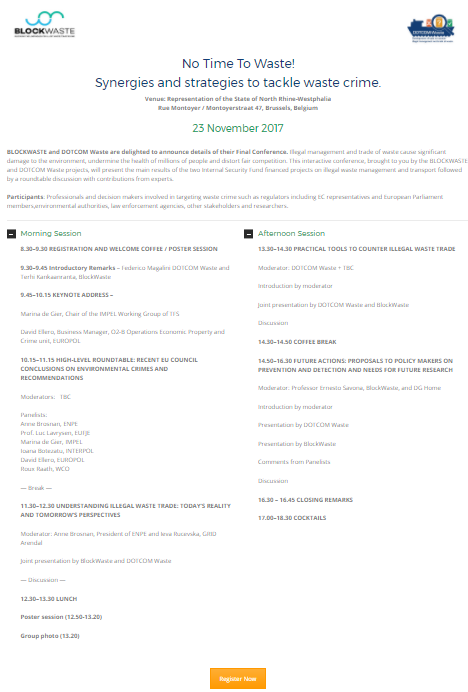 Project Coordinator, Federico Magalini of United Nations University said “We are delighted with the opportunity to co-host this event with BlockWaste and give attendees the opportunity to hear firsthand about the findings of the DOTCOM Waste project and the practical training tools we have developed to help those on the front line of fighting illicit waste trafficking”. The DOTCOM Waste and BlockWaste projects have been funded by the European Commission Directorate-General Migration and Home Affairs. 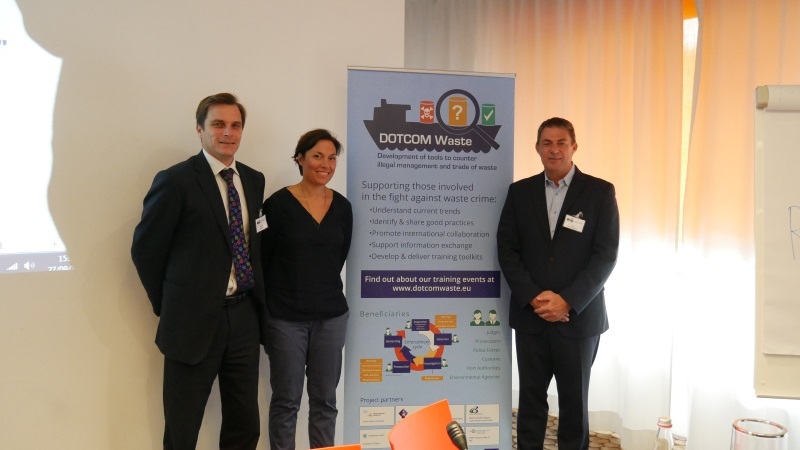 The DOTCOM Waste project seeks to increase the capabilities of law enforcement agencies, customs and port authorities, environmental agencies and prosecutors to fight cross-border waste crime more cost-effectively. To achieve this objective, the project aims to increase the stakeholders’ understanding of current waste crime trends and to identify and share good practices for detecting, investigating and prosecuting waste crime activities. The DOTCOM Waste Project recently hosted a 4-day workshop in Rome, Italy, on how to better prevent, detect, investigate and prosecute waste trafficking. 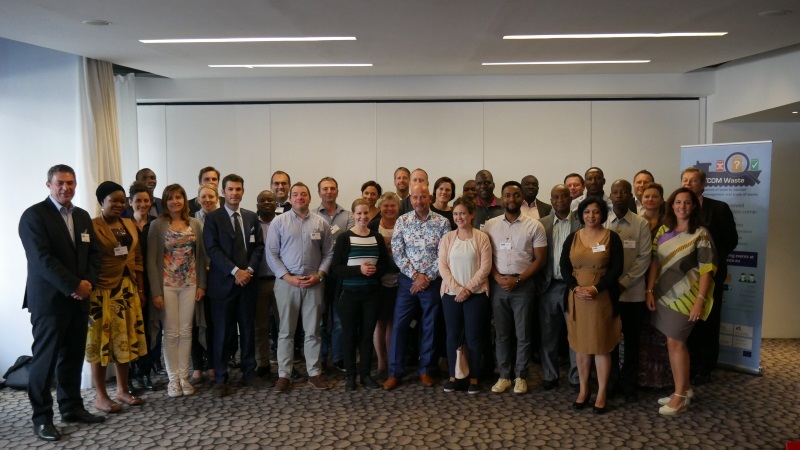 It brought together stakeholders directly involved in the fight against cross-boarder waste crime, from all stages of the enforcement cycle, to participate in a mixture of lectures, practical case studies, open sessions and a study visit. Topics covered included the legislative landscape, waste classification and problematic waste streams, illegal shipments, intelligence-led investigations, inspection and detection, next generation compliance, investigation, prosecution, sentencing and interagency collaboration and networking. As part of the training, the group visited the Port of Civitavecchia, where the Italian Customs Agency gave a tour of the Port and showed the process in opening a suspicious container. Overall the event was a huge success, not just from a training perspective, but also to promote networking and information between the different stakeholders. 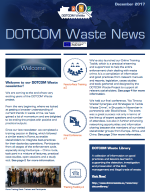 Get your free copy of the DOTCOM Waste newsletter now! As we move to the final stages of DOTCOM Waste, find out how the project is progressing in its objective to help those involved in the fight against transboundary waste crime. Read about our recent e-learning series and find out how you can sign up for our online training toolkit. In addition, read an interview with Marino Martellotta, Official (Lieutenant Colonel) of Arma dei Carabinieri, Department of Environmental and Forest Police. Find out about the line-up of speakers for the final conference and how to register. Click here to download your free copy now! Registration is now open for the final conference of the DOTCOM Waste and BLOCKWASTE projects, entitled “No Time to Waste! Synergies and strategies to tackle waste crime“. The event will take place on 23 November 2017, at Representation of the State of North Rhine-Westphalia, Rue Montoyer / Montoyerstraat 47, Brussels, Belgium. Secure your free place today! Participants: Professionals and decision makers involved in targeting waste crime such as regulators including EC representatives and European Parliament members,environmental authorities, law enforcement agencies, other stakeholders and researchers. 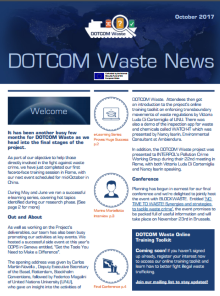 The DOTCOM Waste project increases the capabilities of law enforcement agencies, customs, port authorities, environmental agencies, prosecutors and judges to fight cross-border waste crime. The project provides pragmatic training materials and tools and organizes webinars and face to face training sessions to help key stakeholders to integrate good practices into their day-to-day operations. 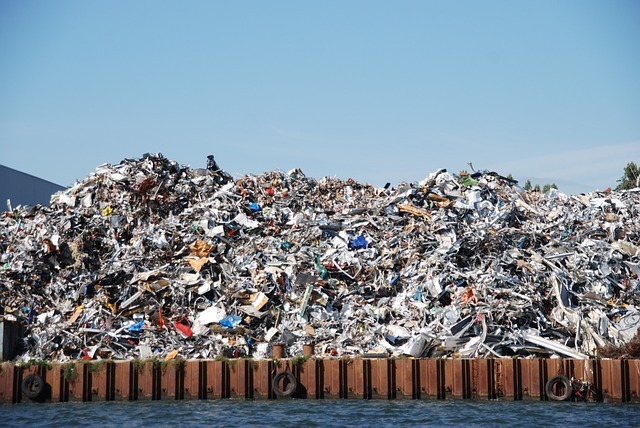 The BlockWaste project identifies illegal operating practices relating to waste trading and shipments, and estimates the amount of illegal earnings made in the waste sector. It also analyses legislation in order to identify needs for amendments to better expose and prevent criminal activity. Both projects share the overall aims of intensifying international collaboration and identifying threats and risks associated with illegal waste shipments in order to support strategic planning and thereby better prevent cross-border waste crime. As part of an European Space Agency (ESA) funded project entitled “Space Based Support Services for Waste Management”, Air and Space Evidence Ltd and Telespazio VEGA Ltd are holding a workshop on ‘Using Satellite Earth Observation and GPS tracking to Combat Waste Crime and Ensure Waste Compliance’. 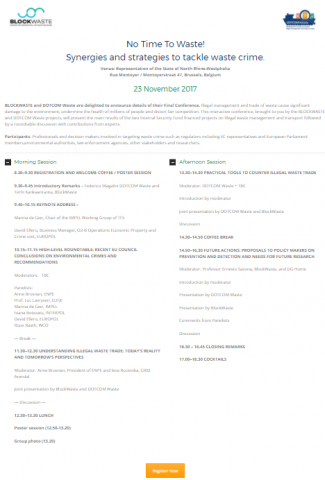 They would like to invite governments, environment agencies, EU bodies and supranational environmental compliance networks to this event on 20th October 2017 at DG Environment, European Commission, Brussels to discuss regulatory needs and the potential opportunities of using space based technologies to combat waste crime and to ensure waste compliance. For more info click here or email info @ space-evidence.net. 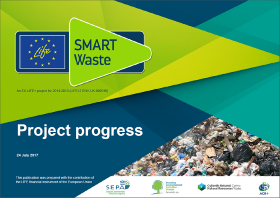 The LIFE SMART Waste project has just published its digital brochure to provide an update on progress at the mid-point in the project. The brochure provides updates on the launch of the project’s communications Hub, intelligence-gathering activities and progress in the development of a range of innovative tools, approaches and techniques (including financial investigation and horizon scanning tools, Remote Sensing and more) that may help us to understand, tackle and reduce waste-related crime. Click here to access it now! The DOTCOM Waste project was presented to INTERPOL’s Pollution Crime Working Group (PCWG) during their 22nd meeting in Rome. After a general introduction on the project by Vittoria Luda Di Cortemiglia of United Nations University, Nancy Isarin, Environmental Consultant at Ambiendura provided a more detailed presentation on the training toolkit – specifically the modules on the planning of inspections, risks assessments and intervention approaches. Secondly Nancy demonstrated the mobile application ‘Watch-IT’. This new app supports law enforcement officers in the field during their inspections of waste shipments and guides them through the often complex decision-making process. The App is developed in co-operation with UN Environment and GRID-Arendal. A number of members of the PCWG have expressed interest to be a part of the user-test group for the App. Further the United States and the African region showed interest in having the app tailored to their regions. 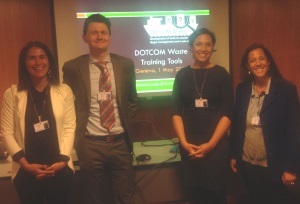 DOTCOM Waste hosted a successful side event at this year’s COPS in Geneva entitled, “Get the Tools You Need to Make a Difference – Global Training Toolkit + Waste & Chemicals Inspection App”. The opening address was given by Carlos Martin-Novella , Deputy Executive Secretary of the Basel, Rotterdam, Stockholm Conventions, followed by Federico Magalini of United Nations University (UNU), who gave an insight into the activities of the DOTCOM Waste Project. The 22nd Annual INTERPOL Pollution Crime Working Group meeting will take place in Rome from 15-17 May 2017 and DOTCOM Waste is delighted to announce that they will be presenting at the event. Nancy Isarin, Environmental Consultant at Ambiendura and Vittoria Luda Di Cortemiglia of United Nations University, will speak on behalf of DOTCOM Waste, outlining the key objectives of the project, as well as promoting relevant activities for attendees to get involved in. The INTERPOL Pollution Crime Working Group initiates and leads a number of projects to combat the transport, trade and disposal of wastes and hazardous substances in contravention of national and international laws. The projects include electronic waste, environmental forensics, clean seas and climate change crime and corruption.